America, your long national nightmare is over! Finally -- a Tonio K. CD of tracks from the '90s! And just in time for the new millenium. 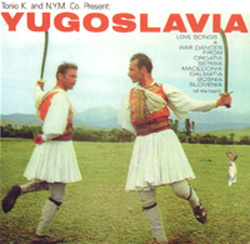 "Yugoslavia" is a 14-track 65-minute collection of (mostly) recently-recorded Tonio K. material. The song list includes the Austin anthem "16 Tons Of Monkeys," the Peter Case co-write "Indians and Aliens" (Case performs on the track), "Student Interview With The Third Richest Man In The World" and three tracks produced by Charlie Sexton (featuring Sexton and his whole band). Despite receiving massive critical praise for "Life in the Foodchain" (1978) and "Amerika" (1980), Tonio K. bounced around from CBS Records, to Arista, to Capitol-EMI (which resulted in the 1983 EP "La Bomba"), before settling into What?/A&M for his third and fourth albums: "Romeo Unchained" (1986) and "Notes from the lost civilization" (1988). Since being "dropped" from A&M, he has been one of the music industry's most successful songwriters, penning the most played song of 1993 ("Love Is," recorded by Vanessa Williams and Brian McKnight), and placing songs with Bonnie Raitt, Aaron Neville, Al Green (from the "Michael" soundtrack), and many others. A fifth album recorded with an all-star cast (Paul Westerberg, David Hidalgo, Peter Case, Bruce Thomas, and others) was canned by A&M and released by Gadfly Records ("Olé") in 1997. A collection of spare tracks and other oddities -- "Rodent Weekend '76-'96 (Approximately)" -- was released by Gadfly Records in 1998. All four of Tonio K.'s earlier full-length albums are available on CD from Gadfly Records.